One year post-American Samoa. Strange. I haven’t been to a beach since July 2014. The closest I’ve come to swimming was when I labored in the birth pool, and that wasn’t anywhere near as relaxing as floating in the channel in Faleasao. Sometimes I speak to our son in a language he’s unlikely to hear anywhere else. I’ve heard Wes do it, too. But already I’ve forgotten so much. I often check our Samoan-English dictionary in search of a word I thought I’d never lose. And there’s no one nearby who can help me–no neighbor I can shout to out the window who will laugh at my pronunciation, no students to be proud of my attempts. Oy. 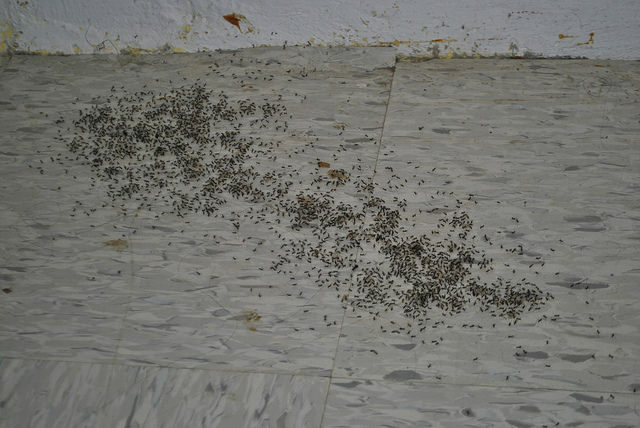 Just a normal, everyday ant pile in the hallway. What a strange thing to miss. Of course more than anything I miss the people. I miss Leafa and the way her laugh carried through our windows. I miss neighbors and students shouting their hellos as they passed by our house. I miss all the kids–even the two little girls who loved to yell derogatory terms and give us the finger. I miss our students. And the dogs. And the beach. And the hot sun on my face. And the sound of waves crashing just beyond the palm trees. And the days when the sun beat down relentlessly until I’d drop the broom right where I stood and walk directly into the ocean with all my clothes on. And I miss the incredibly vast expanse of stars overhead and gazing up at it while lying flat on our backs on the sandy concrete of the wharf and the feeling of smallness that overwhelmed me every time we sat there silently in the dark with the trade winds blowing our hair around. All of that stuff. A lot has changed in a year. In many ways I think that we couldn’t have timed it better–getting pregnant just before we came back. It gave us something else to focus on instead of lamenting the loss of Samoa and the awkward adjustment home. Life today is incredibly different than life was a year or two or three ago, but shouldn’t that always be the case? I’m a mother–that’s a big one. And in many ways Samoa prepared me for this gig. Because I spent three years on a tiny, isolated island wearing holey tshirts and basketball shorts, twisting my dirty hair into messy buns and complaining that my one pair of jeans didn’t fit, the transition to stay-at-home-motherhood hasn’t been too shocking. So what if I put on eyeliner to go to Costco the other day. I probably would’ve done the same thing in Manu’a had there been makeup or warehouse stores. Supposedly the reverse culture-shock doesn’t really hit you until 6-9 months after you repatriate. But I was in my third trimester during those months. We were in the throws of renovation, ripping floors out and painting every surface. I was working when needed, subbing for a few schools here and there. In the classroom, I paid attention to the more obvious distinctions between teaching in a public school in the South Pacific and teaching at private schools in affluent American suburbs. Of course I did. But mostly I didn’t have the time or the mental energy to focus on what I did and didn’t like about being back in America. There was only the thought of my impending labor and readying ourselves for the baby. See? Perfect timing. A beautiful distraction. But now the Stranger is a few months old and I find myself noticing things I hadn’t paid attention to before. There’s the stuff all the books warn you about — the way the vapid, consumeristic, celebrity-worshipping, pop-culture crazed blah that is so pervasive in American culture just wears you down — and then the stuff the books mention but you are certain won’t affect you — the close friend who is completely unrecognizable (surely they’ve changed? or have you? ), the constant feeling of being misunderstood by nearly everyone you speak to about your experiences. It’s a mixed bag. I’m glad to be home. I’m grateful that we were able to return to the friends we love so dearly, to a community that has been nothing but graceful and supportive, to a familiar, comfortable life. But every once in a while I’m disappointed by this culture. I’m saddened by its inability to entertain new ideas and perspectives. I’ve grown weary of the 24 hour news cycle and the constant stream of manufactured problems. Sometimes I’ll go for a walk in our neighborhood and feel overcome with sadness that I don’t know 90% of our neighbors, that I haven’t even seen some of their faces before. Who are all these people? It’s lonely in America. We’re all strangers and so we don’t trust each other and we live our lives separated and in fear and it’s a lonely, sad existence. I miss knowing everyone in my village and being able to disagree with them in person instead of through a computer screen, with its artificial blue glow that somehow makes us all feel like we’re always right. I miss the way face-to-face conversation with people who aren’t like me and maybe don’t share my beliefs makes me more careful and purposeful with my words– I miss the necessary humility and simplicity of daily life. Of course there are a million other things I don’t miss. Those giant spiders. The nightly fear of waking up with a cockroach in my bed. Dogs getting shot for no reason. The open disdain expressed by so many toward palagi and Asians. Knowing your students are being abused and feeling powerless to stop it. Other teachers who don’t care about teaching and simply don’t do it. All that kind of stuff wasn’t fun. Sometimes I have to remind myself that there were reasons we decided to leave, and that there was a time when we were more than ready to get on that plane to Hawaii. I don’t want to see Samoa through rose colored glasses. But I can accept that it’s not perfect and still love it. Just like I have to do here in this country. I realized just yesterday that the new WorldTeach volunteers are probably on island. I have no idea who any of them are, haven’t connected with them on Facebook or read any of their blogs. (For the record, if you are a WT volunteer or applicant, you are always welcome to email me with whatever questions you have about Manu’a.) We no longer know any Americans on Ta’u! I won’t be receiving updates about my students or the goings-on in the village from the palagi perspective (oh but I’m sure I’ll hear about all of them from the village perspective, mwahaha). Every day the distance between us and Manu’a grows. A year ago we hugged our friends and said goodbye. And then. My belly grew. We renovated a house. I delivered our son (pretty much) on a stretcher. We brought him home and started a new life, from two to three in what seemed like the blink of an eye. Somehow, somewhere in there I became a stay at home mom and began freelancing (a dream come true) and Wes became a math tutor. And none of these things came about from our careful planning. God has a sense of humor. I’m sure there’s more I could say, or a better way of saying what I’ve committed to words so far, but it’s late and I believe I’m rambling. I’ve written so many posts since the Stranger arrived that I just haven’t managed to publish. Suddenly everything seems so personal that it’s hard to open up to the internet. If you’re wondering, parenthood is everything I hoped it would be and none of the bad stuff everyone swears it is. The baby is cool as all get out. I think we’ve adjusted just fine. We miss Manu’a every single day. But, yes, we’re glad to be back. This entry was posted in United States and tagged America Samoa, culture shock, manuatele, parenthood, repatriation, worldteach. Bookmark the permalink. I love reading your posts. They are so insightful. Makes me want to experience more than America, our culture. It is sad we don’t know our neighbors. Beautifully written, Cat! I haven’t had a lot of those thoughts in a while. Hard to believe it has been 4 years since we first arrived on Tutuila. Thanks for sharing your thoughts – it has influenced me to reflect on my experience there as well. Hi, great post’s. Had some questions, because me and my fiance are planning to move to Ta’u Manu’a in a couple of months, but dont know how to get a hold of you guys, please assist, thank you.